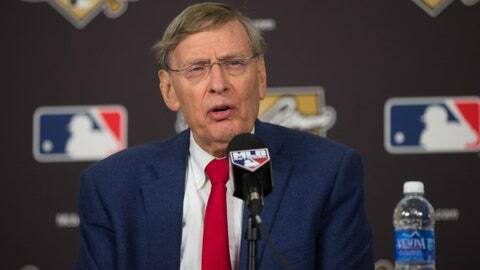 Bud Selig will have presided over two decades of labor peace by the time he retires in January. JUPITER, Fla. – The relationship between Major League Baseball and the MLB Players Association became strained at various points during the past several months – most notably as it related to Alex Rodriguez and the Biogenesis investigation, but also instant replay and home-plate collisions. A slow free-agent market, with stars impacted by draft-pick compensation, hasn’t helped. For the first time in years, there’s anxiety within the industry about the future of labor relations. MLB Commissioner Bud Selig will have presided over two decades of labor peace by the time he retires in January; Selig’s successor will be charged with the weighty task of continuing the streak when the current collective-bargaining agreement expires after the 2016 season. In the meantime, statements by senior MLB and MLBPA officials will be scrutinized for hints as to future negotiating positions – and whether fans actually should fear a work stoppage. MLBPA Executive Director Tony Clark met with reporters after the union’s session with St. Louis Cardinals players Wednesday morning. I asked Clark how he would characterize the working relationship between MLB and the union, and whether it was jeopardized by the contentious offseason. “Michael Weiner, our past executive director, always said – and I will repeat – that labor peace is not the goal,” Clark replied. “An agreement that is in the best interest of the game, the players and management is always the goal. We’ve been very fortunate over the last 20-plus years to have agreements that we believe did exactly that. A very good answer, I thought. It was firm but ended on a hopeful note. No one who cares about the sport wants to see a lockout or strike. But if there is a work stoppage in the 2016-2017 cycle before agreeing on a new CBA, MLB merely would endure what the NBA, NFL and NHL all have in recent years: an interruption before resuming business as usual. But there is one unique circumstance as it relates to 2017: That is the next year in which the World Baseball Classic is scheduled to take place. Selig and MLB officials remain firmly committed to the event, because of its profitability and platform to promote the game globally. Players who have participated in the WBC’s three installments generally rave about their experiences – and the players are paid to compete in the tournament, so the union has been supportive, too. And yet, one cannot deny the reality of the calendar: If CBA negotiations grow contentious in the winter of 2016-2017, will MLB and the MLBPA be in any position to stage an international competition that opens with February training camps? In asking Clark whether he expects the WBC to take place again in 2017, I prefaced my question by saying the tournament isn’t scheduled to occur until after the end of the CBA. A carefully worded answer, to be sure. Clark added that he believes the players want to continue participating in the WBC. “At which point in time they don’t, we’ll adjust accordingly,” he said. “Rest assured, the WBC was great. It was one of those things where I never had an opportunity to play. In ’06 and ’09, I was still active but didn’t have an opportunity at that point. Being involved this time around, I felt like a little kid in a candy store. Once again on a sensitive subject, Clark finished his statement in an optimistic tone but stopped short of aligning himself with MLB’s stance. The commissioner’s office seems to regard the 2017 WBC as a matter-of-fact certainty, and the union could turn that into a pressure point in CBA negotiations. MLB has made the WBC a centerpiece of its global outreach and would rather not allow protracted bargaining talks to jeopardize the tournament’s long-term viability. At this point, there’s no indication baseball officials would consider moving the tournament to 2016 in order to avoid the chronological conflict. The 2017 WBC would, however, include a qualifying round in 2016 for teams that didn’t win a game in last year’s tournament (Australia, Brazil, Mexico and Spain) or qualify at all (Colombia, Germany, Israel, Panama and others). You may care deeply about the WBC. You may not. But do not be surprised if the tournament plays a role in CBA negotiations that have caused nervousness in the national pastime – even three years in the distance.